The Digital Songbook Series is an indispensable resource for today's worship leaders. By focussing on the work of individual songwriters and worship leaders each Digital Songbook offers up a comprehensive guide to some of the most significant songs of our time. Each CD-ROM brings home easily accessed and printable sheet music, chord charts and word masters for fifty of the very best songs within each artist's back catalogue. The writer of countless modern classics, few songwriters have had greater impact than Stuart Townend. By reclaiming the art of the lyricist and the power of the collective voice, Stuart's songs have united the Church worldwide. From 'In Christ Alone' to 'How Deep The Father's Love', from 'There Is A Hope' to 'The Lord's My Shepherd (Psalm 63)', this Digital Songbook contains them all. 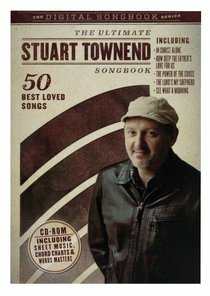 About "Ultimate Stuart Townend Songbook (Cdrom)"
Stuart is known and respected around the world as one of the leading worship songwriters of his generation. The depth of lyrical and theological content in songs such as 'In Christ Alone', 'How Deep The Father's Love', 'The Power Of The Cross' and 'Beautiful Saviour' have caused some to draw comparisons with the greats of previous generations such as Watts and Wesley; while the marriage of great lyrics with wonderfully accessible melodies (largely through his successful writing partnership with Keith Getty) means his songs bridge different musical and cultural genres, and reach into every corner of the globe.Stuart is also a gifted worship leader, musician, recording artist and seminar speaker, and spends a good part of his year leading worship at major Christian events, doing solo concerts, recording studio albums, and training emerging worship leaders and songwriters. He has featured on numerous live worship albums down the years, in addition to his solo albums 'Say the Word' (1997), 'Personal Worship' (1999), 'Lord of Every Heart' (2002), 'Monument to Mercy' (2006), 'The Best of Stuart Townend Live' (2007), 'There is a Hope CD & DVD' (2008), 'Creation Sings' (2009) and 'The Journey' (2011).Stuart was born in 1963, and grew up as the youngest of four children in a Christian family in West Yorkshire where his father was a Church of England vicar. From an early age Stuart played music with his brothers (one brother, Ian, went on to become a member of the group Heartbeat), beginning to play the piano at the age of 7, and teaching himself the guitar as a teenager.It was while living in West Yorkshire that at the age of 13 he made his Christian commitment. Then at 18 he moved to Brighton to study literature at the University of Sussex. It is here he met Caroline, whom he married in 1988, and they now have three children; Joseph, Emma, and Eden.Stuart attends and regularly leads worship at CCK in Brighton, one of the New Frontiers network of churches headed up by Terry Virgo. The church is also home to a number of well-known figures in the area of worship, including Paul Oakley, Lou Fellingham, Phatfish, Simon Brading and Dave Fellingham, who has played a significant role in mentoring Stuart. The church also runs a training programme for worship leaders and musicians called the Worship School.But it is as a songwriter that Stuart has had the greatest impact on the worldwide church, and it is this that is closest to his heart. "It is so important that our lives are built not on our feelings or circumstances, but on the word of God, and songs can really help us to meditate on and retain truth. I know from the correspondence I regularly receive that if you can express in songs the profound truth of the gospel in a poetic yet accessible way, they really can have an impact in people's lives.